With my Internet still giving me problems on a daily basis, I’m channeling my frustration into motivation. The downtime is reminding me that I still need to work harder in order to turn this daily habit into a way for me to make a living. 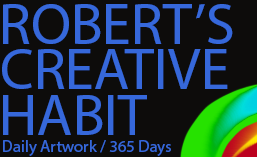 I still have to find something in my artwork – in my skill set – that can resonate with complete strangers. I need to find my niche, something people will recognize as something uniquely my own. Creating a web comic is fine and all that, but how many of those are already out there? How will people find mine? What are they searching for? Who is my audience? These are all questions I’ve thought a lot about over the past year since I began taking my artwork seriously by doing it full-time. However, I really don’t have any solid answers yet, despite all I’ve learned so far. I’m still in the process of learning right now. I’m sure it’s possible to make a living when you’re still figuring things out, but I just haven’t found it yet. My stores are easy to find, I have a Patreon page that I reference all the time, and I’m all over social media. I feel that I have those things covered, and it’s been like that for a little while now. So what’s left is either getting better at the business side of things, or just continuing to make higher quality artwork. As far as “getting better at the business side” goes, I still feel pretty uncomfortable with self promotion. Frankly, I don’t feel that I’m capable of gauging whether something is shameless, or not. “Hey look! Here’s some of my artwork. It’s awesome. Give me money and I’ll make some more!” is what I see everywhere, and it appears to be working. However, doing that goes against my better judgement. It just doesn’t make me feel good to think that way. So, I guess I better talk a little about what I drew today. Well, I added a staff there on the floor. Looks like the wiz is a little to fascinated with his story book to worry about what happens to it though. 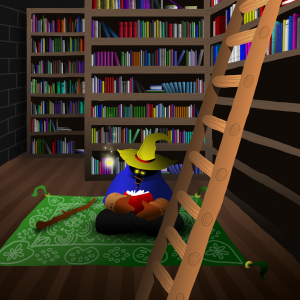 I also added a whole bunch of details on the ladder, the books, the wizard’s clothing and eyes, and the shelves themselves. Finally, I also finished the middle shelf by adding the rest of the books. I think all that’s left – as far as the main work anyways – is to fill the shelf on the right with those angled books. Then I can go over it a last time to add whatever details I’d like. Can you think of anything that’s missing? Or maybe something doesn’t look quite right? What draws your eyes? I’ve been looking at this thing for so long that it’s quite possible there is a lot of things I’m taking for granted.